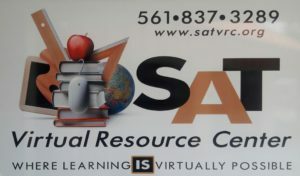 SAT Virtual Resource Center (SATVRC) is a private, non-profit, Christian based, learning institution. We are dedicated to the teaching and the development of our future leaders. We are approved to accept McKay scholarships and Florida Tax Credit (Step-Up) scholarships. In addition to our educational offering, we provide tutoring, homeschool evaluations, FCAT tutoring, and study club. The mission of SATVRC is to provide facilities, services, and committed resources which enable private, home, and public educated students the opportunity to learn in a supervised, non-threatening environment. SATVRC is committed to educating and empowering our future leaders through private and virtual education channels. Traditional ‘brick and mortar’ education is readily provided as well as ‘click and mortar’ for those who desire the use of modern technology. The Resource Center is dedicated to providing the appropriate services to satisfy all students who are actively pursuing private school, home school, or public school education. SATVRC was established in 2004, and has been responsible for providing a safe environment and convenient facility to enhance the learning of all students. We are an organization that has recognized a need in extending online education. We have responded to that need by providing the necessary resources in the form of a facility, computers and Internet access. We have also provided a safe and friendly environment for students to conduct there learning and to interact with other students who have chosen the same path. Our business is located at 3951 Haverhill Road, Suite 108, West Palm Beach, FL 33417. You can reach us at 561-837-3289 and by fax at 561-687-4489. We are looking forward to hearing from you. You can also contact us at our e-mail address: info@satvrc.org. SATVRC would like to welcome back all of our students. Trusting your summer was special and you are now eager to gain new knowledge. We look forward to having an awesome learning experience. Wishing you God’s best as you enter the new school year. Copyright ©2019 SAT Virtual Resource Center. Education Zone by Rara Theme. Powered by WordPress.